1. Remove the center console (see page 20-158). 2. Move the shift lever to R.
3. Remove the nut securing the shift cable end. 4. Unlock the retainer (A). 5. Rotate the socket holder retainer (A) counterclockwise (B) until it stops, and push the retainer lock (C) into the socket holder retainer to lock the retainer. 6. Slide the socket holder (A) away from the bracket as shown to remove the shift cable (B) from the shift cable bracket (C). Do not remove the shift cable by pulling the shift cable guide (D). 7. 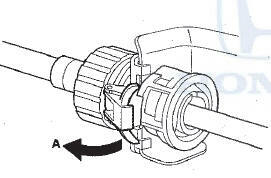 Disconnect the shift lock solenoid connector (A) and the park pin switch/A/T gear position indicator panel light connector (B). 8. Remove the shift lock solenoid connector, the park pin switch/A/T gear position indicator panel light connector, and the harness cover (C) from the shift lever bracket base. 9. 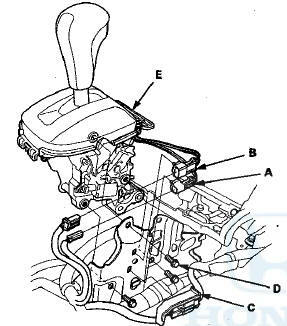 Remove the shift lever mounting bolts (D), then remove the shift lever assembly (E).